What triggers facultative winter migration of Great Bustard (Otis tarda) in Central Europe? The Great Bustard is on the brink of extinction in Central Europe. Its population is known to suffer high mortality during hard winters, particularly when severe weather conditions cause migration. Long-term winter food management in two populations in Germany did not prevent migration events. To identify migration-triggering factors we tested the potential influence of snow, temperature, phase of winter and development of a tradition of migration. Comparing migratory behaviour with long-term local weather records, we found that snow cover is a much stronger trigger for migration than frost and low temperatures. We conclude that snow heavily affects the Great Bustard’s energy balance mediated not only by limited food access but also by the particular properties of its plumage. This could explain migration events despite food availability and is consistent with our results concerning a tendency for females to undertake facultative winter migration more than males. 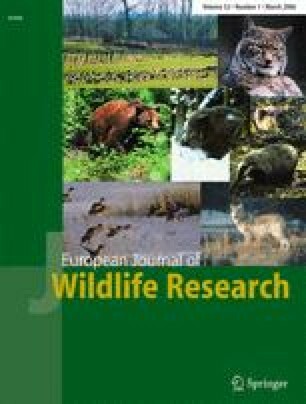 Available data are currently insufficient to confirm or reject the idea that Great Bustard populations develop a tradition of migratory behaviour following a previous winter migration, and we found no evidence for a decrease in the disposition of the Great Bustard to migrate during the course of winter. The field observations comply with the current laws of Germany. The authors thank J. Fickel and M. East for improving the English and substantial suggestions. They also thank D. Hummel for helpful comments. Special thanks is devoted to C. Pitra, who initiated the research to this subject and contributed to an early draft. Beyond the scope of this paper, C. Pitra has, in all our years of mutual work, always put forward inspiring ideas as a colleague, as a cooperation partner, as head of the department, and above all, as a passionate and ambitious scientist.